WASHINGTON — From Somerset, Pennsylvania to the Pentagon, and on to New York City, hundreds of motorcyclists will ride next month commemorating the 9/11 attacks, while raising scholarship money for children of first responders. “In 13 years we’ve given out $392,000 worth of scholarships,” said Ted Sjurseth, of Leesburg, Virginia, founder of America’s 9/11 Foundation, the sponsor of America’s 9/11 Ride. Leesburg is one of the places on the route that is rolling out the welcome mat for the ride, waiving the nearly $5,000 public safety fee to support the event when the bikes ride through town. “Leesburg has an outpouring of people that you won’t believe for a motorcycle ride that’s going to take eight to 10 minutes,” Sjurseth said. The ride, which began in November 2001, is resuming after a one year break because of the demand for scholarships from children of first responders. Sjurseth said over 1,400 essays came in support of the ride’s return. The ride will begin Aug. 17 in Somerset, where United Flight 93 was forced down in the 9/11 attacks. The motorcyclists will ride south through Maryland past Cumberland and Hagerstown, and pass by Leesburg around 1:30 p.m.
On August 18, the riders will rally at the Pentagon before riding north to the Sept. 11 memorial in New York City. “This is a way of saying thank you to the first responders today, who put their lives on the line for you and me,” Sjurseth said. 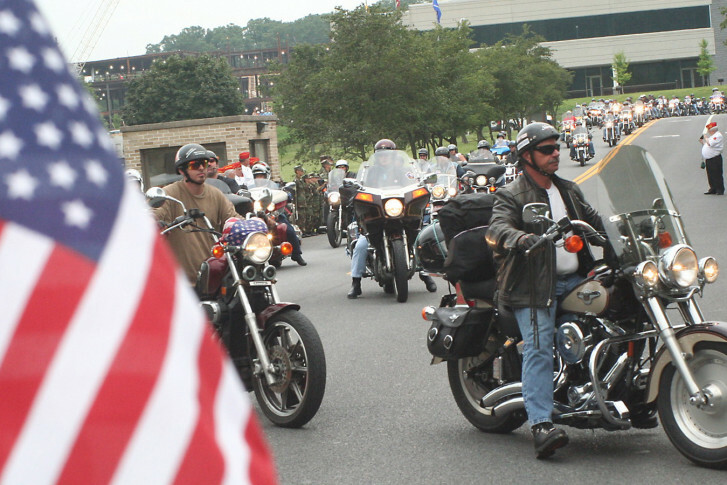 According to the ride’s itinerary, after Leesburg, the procession of about 600 motorcycles will ride the Dulles Toll Road to Interstate 66 eastbound to Route 110 near the Pentagon.